With the holidays upon us, parents concerned about the health, weight, and/or diets of their kids may be in that customary quandary: to be, or not to be, the food police? I advise against it. For kids, as for adults, good food and good health should not be enemies to good times. They can, and should, roll together. My wife and I have raised five children, and I am delighted to say that they have all grown up not only healthy and lean, but inclined to eat well. This is not, however, because my wife and I were food cops all these years. Rather, we took advantage of the fact that taste buds learn to love the foods they’re with. One particularly vivid validation of that contention springs to mind. I can no longer remember whose party it was, or even where exactly. But I recall that my wife and I were at some party with several, if not all, of our then quite young children. The inevitable cake came out, and at a glance it was clear it contained the sugar content consumed by some small countries in a year. My wife and I looked at one another, wondering if we should invoke parental executive privilege, and prohibit this sugar-overdose-waiting-to-happen. But we shrugged our shoulders, and went the other way. It was a party, after all, and since our kids never ate like this at home –they certainly enjoyed desserts, but carefully chosen, often homemade, and always far more nutritious and less sugary than this one- what harm could this isolated indulgence really do? I recall, as well, the vicarious pleasure I felt watching my kids’ eyes widen with anticipatory delight, waiting in line for their slices. But then came the gratifying surprise. Each of our kids, with license to indulge, took one bite of that beckoning confection, then wrinkled up their faces- and looked for a place to spit it out. It was so much sweeter than anything they ever ate- they hated it. That anecdote is testimony to something fairly universal and quite powerful: familiarity is one of the more important determinants of dietary preference. This is as true for us as for our children. Eat well year round, and even your holiday indulgences will tend to be less indulgent- not because of asceticism, but because of preference. Once you learn to love foods that love you back- foods lower in sugar and salt; free of unhealthy oils; higher in fiber; with fewer, more wholesome ingredients- it’s hard to love eating anything else. I have called the process of getting there from here “taste bud rehab,” (and provide guidance on applying the strategy in my book, Disease Proof). The earlier in life one does this, the better; but it’s never too late, either. Trade up your choices, dial down your intake of sugar, salt, and superfluous ingredients- and transition your palate to prefer more wholesome fare. Take your kids along, and they will be inclined, as kids always are, to copy you; no cops required. 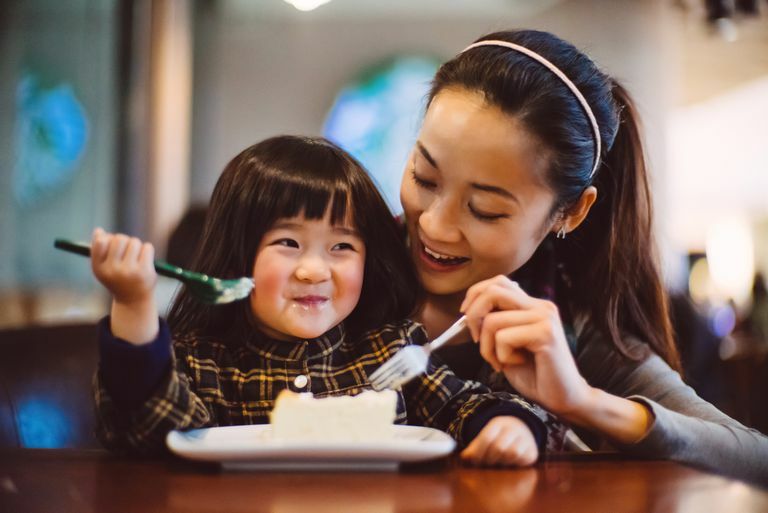 Most of the research evidence on the topic of food restriction, the heavy-handed approach to controlling a child’s food intake, indicates the tactic tends to backfire. Strictly regulating food intake propagates preoccupation, and a proclivity for rebellion. But having only wholesome food choices in your home throughout the year, setting the example you want your kids to follow, and then relaxing at parties- does just the opposite. You help your kids eat well as a matter of preference, not policing. Holiday parties are not the best time to start taste bud rehab, for yourself or your kids. It’s really how we eat year round that influences health and weight. So relax, and enjoy the parties. But recognize that good food, good health, and good times can all converge- for you and your kids- simply by setting a good standard throughout the year. The result, in time for next year’s holiday parties if not this year’s, is you can let your kids have access to that ominous cake, and like my kids- there’s a good chance they simply won’t be able to swallow it. Paradoxically, I think this translates for us parents into having our cake- and eating it, too! How Many Calories Does It Take to Gain or Lose a Pound of Fat? Is Calorie Labeling Helpful in the Fight Against Childhood Obesity?